Dashboard warning lights are the symbols that light up on the dashboard to signal that there is something malfunctioning with the vehicle. 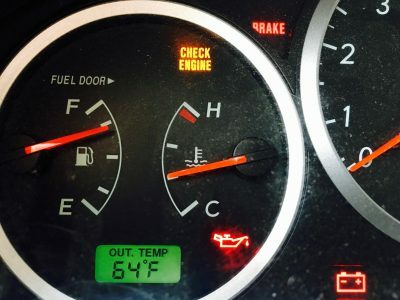 They’re designed to illuminate to show a problem with a specific system, but sometimes it means there is a problem with the warning lights themselves. Each symbol has a unique meaning, and when a dash light turns on, it’s important to have it checked out so that you can either correct the problem, or be sure that the vehicle is safe. It’s normal for multiple lights to turn on when the engine first starts, but they should turn off after a few seconds. When lights stay on after the first few seconds, they’re giving you a warning that something is wrong with the car. A dashboard warning light does not usually mean that the vehicle will stop working immediately, or that it is a danger to drive short distances, like to a collision repair shop. Driving long distances with the warning lights illuminated not advised. The more time passes, the more likely it is that the issue will grow and spread. Depending on the warning light, you may be able to tell what your vehicle needs. For example, when the engine oil pressure light is on, check your records to see when your last oil change was. Under the hood, check the oil level. It may be time to top off the oil or have it changed. Is your brake system light illuminated? First, make sure you haven’t left the parking brake on. A vehicle without brakes can be extremely dangerous to people inside and outside the vehicle, so if this isn’t the case, it’s best to have the brakes checked out. What if Multiple Lights Stay On? If more than one dash warning light is on, it might just mean that you have problems in more than one system. After a collision, multiple lights may be on if multiple systems were affected by the crash. If the airbags were deployed during the crash, they will need to be reset, otherwise the dash light will show an error with the airbag system. However, if all of your lights turn on suddenly, it could indicate an issue with your alternator. While the purpose of warning lights is to let you know that there is a problem, it is not always immediately clear what the problem is. It’s best to have a qualified collision repair technician analyze the vehicle. The sooner you have it taken care of, the less likely there is to be extensive damage.